On March 6-7, Nar Mobile, Swiss OnAir and Azerbaijani Airlines (AZAL) presented 'NarAir' to journalists, showcasing the mobile communication services provided on AZAL aircraft. During the presentation prior to the flight, the management of Nar Mobile, OnAir and AZAL met the Media representatives and spoke about specialties of the projects and the stages of implementation. 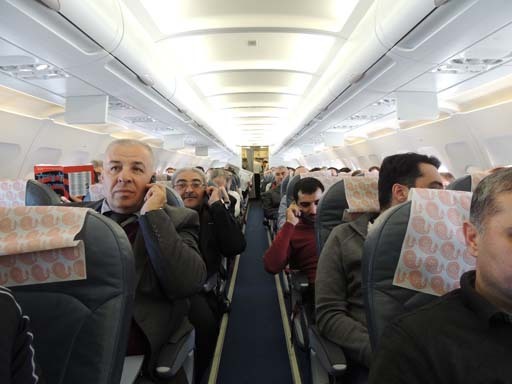 During the flight to Kiev, the journalists were able to use their own mobile phones to make calls, as well as send text messages, check email, browse the Internet, etc. They were accompanied on the flight by Mrs. Nigar Arpadarai, Head of Public Relations and Corporate Communications, Mr. Maharram Aliyev, Assistant to the President of Azerbaijan Airlines, and Mr. Daniel Froehly, Head of Business Development for Northern and Central Europe at OnAir. The journalists also had an opportunity to take a closer look at the inflight network and mobile communication configuration process. Daniel Froehly discussed the technical elements, in particular highlighting that it is safe to use mobile phones on aircraft that are equipped with the inflight connectivity technology. Mrs. Leyla Nasrullayeva, Chief Sales Officer congratulated the team on the successful program and noted the significance of this project: "Communication plays an important role in everyone's life. No matter where we go, we are used to being able to use our mobile phones. Azerfon is providing the first mobile services in the skies in the whole region and the service is fully operational. I congratulate everyone involved and I'm sure this project will be instrumental in the further development of Azerbaijan's national ICT sector as a whole". "Not long ago, nobody could imagine making a phone call during a flight," said Daniel Froehly. "However, OnAir inflight connectivity has now been deployed and from now on, AZAL passengers will be able to stay in touch with the families, friends and colleagues during flights, as well as update their social media accounts, check the news and surf the Internet. My congratulations to all concerned at both Azerfon and AZAL." Mr. Maharram Safarli, Assistant to the President of Azerbaijan Airlines noted that this project would be a great contribution into 2013 - a Year of Telecommunications in Azerbaijan, and stressed its innovativeness. OnAir's inflight connectivity services are used by a number of airlines around the world: Aeroflot, Azerbaijan Airlines, British Airways, Egyptair, Emirates, Etihad Airways, Hong Kong Airlines, Libyan Airlines, Oman Air, Tap Portugal, Qatar Airways, Royal Jordanian, Saudi Arabian Airlines, Singapore Airlines and TAM. OnAir sets the benchmark for global inflight connectivity services, with 50 customers on five continents. OnAir is the only provider to offer consistent global coverage for both inflight GSM and Wi-Fi, thanks to over 80 regulatory approvals, 350 roaming agreements, and by using Inmarsat's I4 satellite networks. 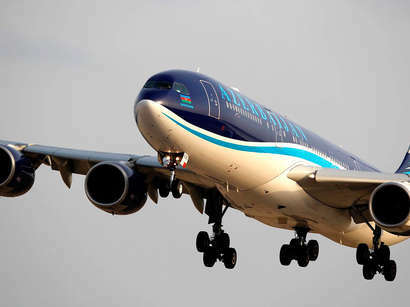 Azerbaijan Airlines (AZAL) is part of the Azerbaijan Hava Yollari Closed Joint Stock Company, the biggest Azerbaijani airline and national flag carrier. Headquartered in Baku, it is a member of the International Air Transport Association (IATA). Known as the Nar Mobile brand, the Azerfon Telecommunication Company started its activities in 2007. Currently, the network of the Azerfon Company covers 80% of Azerbaijani territory and offers a 3G technology based network to extend high quality communication services.